This year Miratech will hold two M-Force events – one in Kyiv on June 10, and one in New York on September 15-16. Miratech Partners and top management will participate in both events. M-Force will offer the opportunity to strengthen our professional ties, and have a great time with fellow Partners. For the Kyiv event, Partners are encouraged to arrive on June 9 for a special evening dinner with our executives, network at working sessions at the Miratech Kyiv facilities on June 10, and enjoy a tour of Kyiv, one of the most beautiful cities in Europe the morning of June 11. In addition, Partners are invited to stay for our Company Day party starting the afternoon of June 11. We will mark 27 years in business with fun celebrations. Miratech is happy to assist with multi-day accommodations and provide transportation to and from the airport. Spouses or significant others are also welcome to attend. M-Force events provide the perfect backdrop to learn firsthand about customer success stories, exchange information about new opportunities, and develop new business ties and connections. Partners will have the chance to speak directly with, and ask questions of, Miratech’s top executives, including CEO Valeriy Kutsyy. Partners will also learn new ways to benefit from their cooperation with Miratech and the Partner Community, leverage each other`s skillsets, go-to-market strategies on global markets, and new approaches for promoting their and Miratech`s services. Partners won’t want to miss these opportunities to network with peers, gain new business knowledge, and enjoy all that these two great cities have to offer. While not as familiar as some other tourist destinations – such as London, Paris, and Moscow – Kyiv is one of the largest European cities and has much to offer for visitors. Those who stay in Kyiv for the first time will fall in love with this charming city and return again and again to explore its fascinating history, developed industry, high-quality educational institutions, and advanced scientific community. We invite you to start getting to know Kyiv during your M-Force visit! Situated on the Dnipro River, Kyiv is the capital of Ukraine, home to about three million citizens and considered one of Europe`s greenest cities. Many of its architectural monuments are recognized as world treasures, and it is the largest cultural, scientific, and industrial center of Ukraine, as well as a destination for religious pilgrimages. 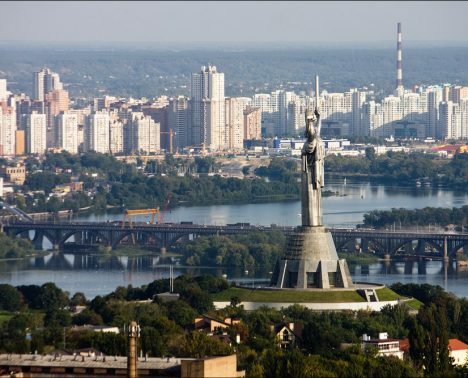 The city’s beautiful landscapes, parks, and gardens captivate visitors, making Kyiv a very popular tourist spot. Ukrainians are hospitable, and always delighted to introduce visitors from around the world to their rich Slavic culture. We know you’ll enjoy Kyiv’s art, history, architecture, outdoor beauty, wonderful food, and friendly people. Miratech’s Kyiv operations are located in a state-of-the-art business center that offers a safe, healthy, productive work environment for our employees. 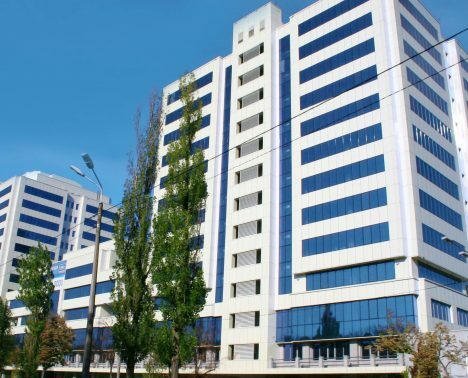 Miratech’s Kyiv office is located near the intellectual center of the city, surrounded by three national technical universities, providing a diverse source of local talent. The office is certified according to ISO f27001 for IT security and ISO 22301 for business continuity, which in turn guarantees smooth and secure service delivery to our customers. Access permission management, video surveillance, internal security processes and procedures assure that customer’s information is handled in confidential manner. For employees’ comfort, the facility has an open-concept floor plan. The office is well-equipped with a gym, food court, showers, and other amenities. It also includes special facilities for the disabled, as well as a daycare center for working parents. The building is close to a park and multiple services, including cafés, restaurants, a bank, and a fitness center. The office also reflects Miratech’s interest in environmental protection, with the latest green technologies: an energy-efficient lighting system; a motion-driven water saving solution; reduced paper use; eco-friendly furniture made from 100% recycled materials; and environmentally friendly building materials, including non-toxic paints and eco-friendly flooring. We look forward to showing you our workplace when you visit for the M-Force event! To familiarize yourself with the office in advance, take a preliminary online tour.